It is always pleasant to see a modern interpretation of vintage allure on the runway, and in the case of Miu Miu, throwback ideals were shaken up, not stirred. Miu Miu's Fall 2015 Fashion Week presentation hit the Parisian runway with much aplomb and not a little rebellion, mixing prints, patterns, texture, and eras with wild abandon. However, the key message was clear: the time has come to revisit vintage trends no one ever thought would reenter society. First on Miu Miu's docket was the overarching presence of tweed. Tweed swing skirts and tweed pea coats firmly placed the collection in the 1970s, giving the entire presentation a nostalgic tint. The label further nodded to bygone eras with the addition of mod mini skirts in a-line silhouettes, and a handful of swinging '60s shift dresses rendered in bright patent material. However, Miuccia Prada would never leave a collection hanging in the 20th century. To dispel the illusion that audience members had time traveled several decades back, Miu Miu created an aesthetically complex clash of fabrics and patterns instead of sticking to monochrome, matching ensembles. Demure tweed collided with crimson patent leather, striped tees were discordantly paired with windowpane knits, and python accents ornamented each ensemble, giving the tweed a bit of grit and avant-garde modernity. 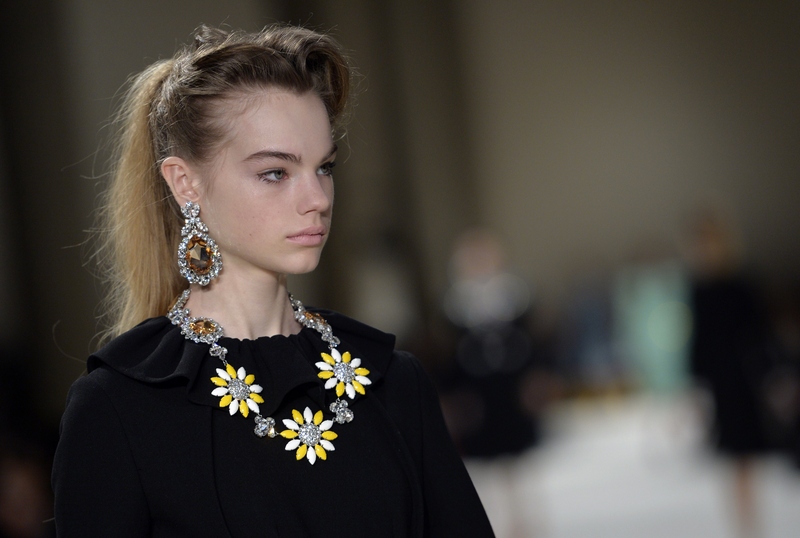 Of course, a truly inspired collection would be nothing without a smattering of well-placed accessories, and in this arena Miu Miu backtracked to the collection's '60s and '70s undercurrent yet again. Square, ombre sunglasses were ostentatiously coupled with vibrantly hued door knocker earrings, and each model carried a compact top-handle purse rendered in contrasting shades of leather. Whatever your feelings towards vintage fashion, it appears that you may want to make your peace, as the trend isn't headed back into hibernation anytime soon.